Welcome to the eMagazine version of Mining & Exploration. 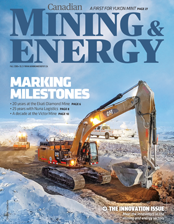 Our eMagazine is an exact copy of the print version of Mining & Exploration—which is published four times a year—so it gives you all the same great articles in an easy-to-read format. In addition, it provides immediate links to any online resources you come across in the magazine. To receive an email notification when our latest eMagazine is ready to view, go to our subscribe page. Welcome to the Innovation Issue and read all about assorted innovators in the mining and energy sectors. As well, we mark several milestones: 20 years at the Ekati Diamond Mine, 25 years with Nuna Logistics (also involved in the diamond industry) and a decade at the Victor Diamond Mine. Other stories focus on “rock star” Brandon Macdonald of Fireweed Zinc, and a new player in the Elk Valley coal industry, namely North Coal. And be sure to check out the Yukon Mint’s recently released gold coins. 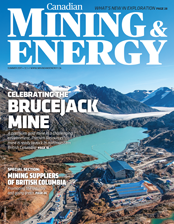 This issue features a special section on Mining Suppliers in which we profile over a dozen businesses that deliver a vast range of products and services to the mining industry. We also cover three mining supplier associations and the benefits they deliver to their members. And read about the future demand for specialized skills needed in the Canadian mining labour market. In this issue, the focus is on sustainability. 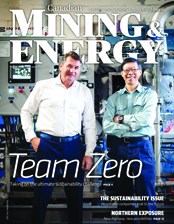 Read articles about solar and wind energy projects, promising biofuels, and the push by a number of companies towards achieving zero liquid emissions in the mining industry. As well, we look at the federal government’s new Supercluster initiative, we celebrate 45 years of leadership at Fording River Operations in B.C.’s Elk Valley, and we visit the new all-season Inuvik Tuktoyaktuk Highway, which is opening up gas field exploration in the Northwest Territories. 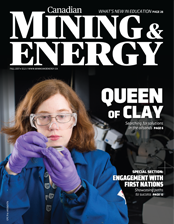 This issue features a special section on Engagement with First Nations in which we present success stories of resource companies and Indigenous groups forging alliances to make development happen in mutually beneficial ways. We also cover tungsten, large Canadian diamonds, a novel exploration tool and several education programs geared to align with industry needs. 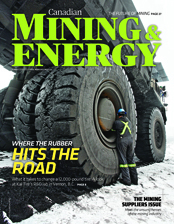 We present an in-depth coverage of a gold mine in northwestern British Columbia. Pretivm Resources’ Brucejack Mine is a gigantic project in a challenging environment. Meet some of the people who made it possible, including a construction company that tackles projects that other companies aren't interested in. We also cover a rare gemstone, potash, renewable energy advances and even airships for product transport.